And my little 1999 Honda Accord was none too happy about the slow moving in such hot weather. I overheated twice on the way there, and had to turn the A/C off and the heater on for the remainder of my drive. But I made it. Hot and sweaty, but I made it. It was about 5:45 pm. I changed into my clothes in the pasenger seat of my car, put on a little make up, and tried to fix up my limp mess of a hair do. It was 105 degrees. I checked in at the front desk, got my luau inspired name tag, and was in. I had never been so happy to see free booze in my life! There were big dispensers filled with a tropical conconction that was just what this girl needed to relax and enjoy the rest of the event. The Follow Your Heart folks really put on a great party. There were tables set up throughout the area, and booths with beer, wine, and the Rainforest Alliance was there sharing information on Palm Oil and Follow Your Heart's commitment to using only sustainably grown Palm Oil grown in non Orangutan habitats. You can read more about Shreds for Change, here. In addition to the booze and booths, there were tours of the factory. 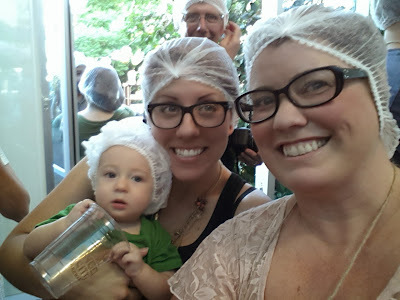 It was really fun to see where some of the wonderful and delicious products like Vegenaise are developed and made. which was a really nice change from the heat outdoors! Well, all I can say is that I pretty much failed as a vegan blogger when it came to taking pictures of all of the wonderful food they fed us. Luckily, The fine folks at Vegetarians In Paradise took lots of pictures of the food. And the food was great! 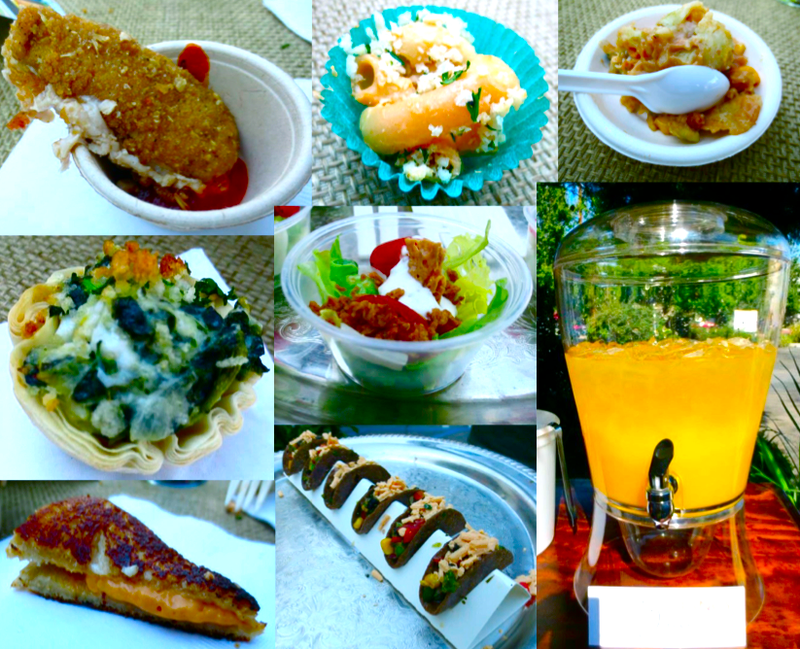 We were served mini appetizer sized versions of traditionally bigger foods all featuring products from Follow Your Heart! We got mini grilled cheeses, cheese stuffed chik'n fingers with marinara for dipping, mini tacos, mini quiches, mac and cheese, enchiladas, and my absolute favorite, the mini wedge salad featuring Follow Your Heart's new Vegan Bleu Cheese dressing. This stuff is incredible. And I have been craving it ever since that party. But I cannot seem to find it anywhere around here. I think an online order is in order before I have a serious vegan bleu cheese melt down. Now let's talk for a minute about the new Vegan Shreds, since that is what this party was all about, right? So, I was able to get my hands on the cheddar flavor. The store was all out of Mozzarella and Fiesta. That's a good sign, right? So I decided to play around with it. I didn't want to make Mac and Cheese, because I wanted to really showcase the cheese. 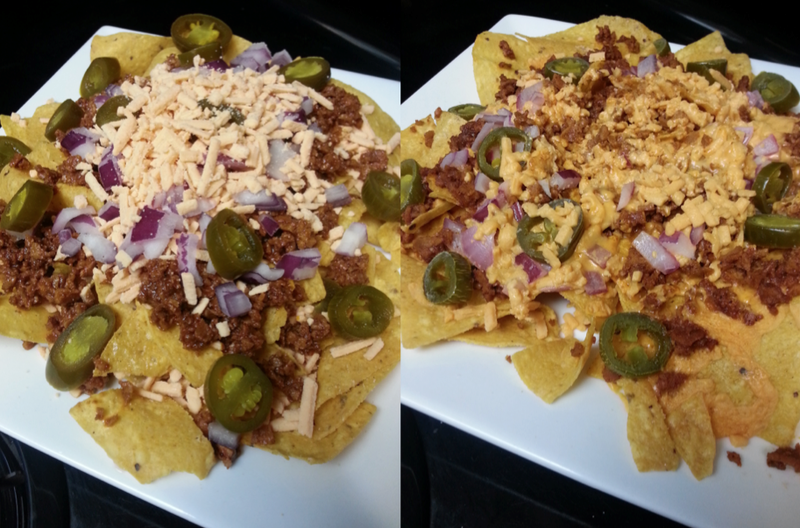 So, remember last Friday when I said I was gonna make some nachos? Nachos, uncooked on the left, after 3 minutes in the microwave on the right. 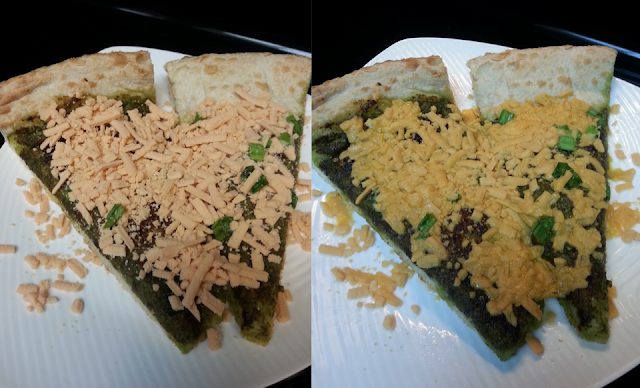 Pesto pizza, uncooked on the left, after 90 seconds in the microwave on the right. The verdict? Well, as you can see, the meltability was only so-so. After a ridiculously long time in the microwave, these shreds pretty much remained the same shape. But more importantly, how did they taste? Damn tasty! Tasted like cheddar, and despite the fact that they seemed not to melt, when they were hot, they were indeed gooey to the bite, and creamy. Would I buy them again? Absolutely. 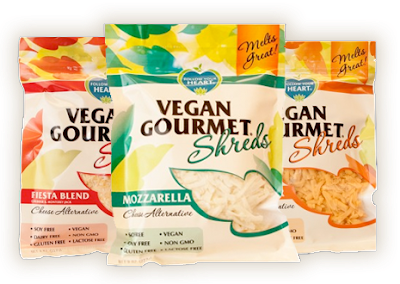 I am glad there is another vegan shredded option on the market. And I am looking forward to trying the Mozzarella and Fiesta flavors. So for today's giveaway, I am putting together a Follow Your Heart prize pack packed up all pretty in a Follow Your Heart tote bag. In it will be a coupon for vegan shreds and a whole bunch of other FYH yummy stuff, provided by me and the fine folks at Follow Your Heart. Because I will be shipping perishables, this giveaway is only open to those within the US. Sorry, international readers. Simply follow the prompts in the widget below to enter! I seriously don't think I could live without Vegenaise. Sometimes it feels like I use it in everything I eat! I'm excited about the shreds! I haven't attempted Follow Your Heart in block form for 7 years, but I'm ready for this. Veganaise is one of the few vegan products I can get here. I use it ALL the time. I would love to try their cheeses. I've only seen the shreds with casien here. I go through giant tubs of veganaise, love that stuff! I also prefer FYH mozzerella cheese for pizzas over Daiya. The Vegan Gourmet Cheddar block is my favorite. I use the Veganaise but that's sadly the only product of theirs I've found locally ((SMALL town in a very non veg area)) I'm going to be on the lookout for more this cheese sounds great! I really love Veganaise, but can't seem to find the cheeze. An online order may be in order! I haven't tried many Follow Your Heart products, but I'd like to try them!!! I used to use FYH cheeses but then when Daiya came on the market, I haven't kept up with their products. I'd love to try these again. Vegenaise is my favorite FYH product. I like it on vegan BLT's! FYH cheeses were my first product. I miss FYH products! They aren't as available around here as Daiya is. Um... I've never used a Follow Your Heart product. I've always really wanted to try them but I've had some yucky vegan cheeses in the past so I'm too nervous to stray from Daiya. I always stand there and think, "I'll do it this time!" but I don't. i usually use daiya, but i need to try these!! 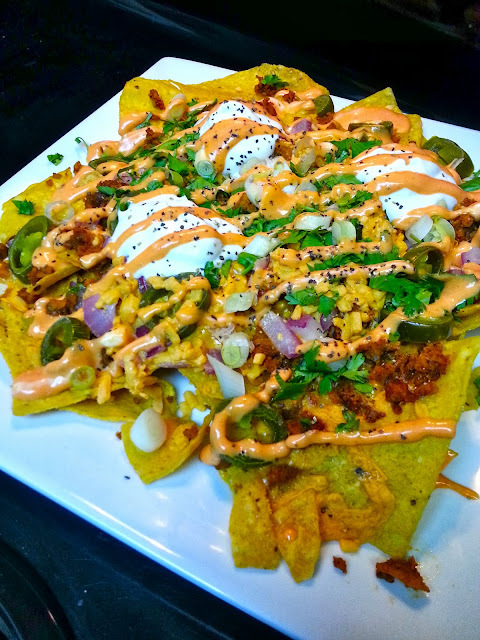 Those nachos look AMAZING. I want them, like, right this moment. Follow Your Heart has a lot of great products (I'm still searching for the bleu cheese dressing), but mark me down for another vote for Vegenaise! yup vegenaise indeed is a permanent fixture here too. i think i will gladly take good tasting cheese even if the meltyness isnt that great! I haven't had the chance to try them, but OMG, vegan blue cheese dressing?! I honestly haven't tried any of their products, but I would love to be able to if I win the giveaway! These shreds look fantastic. My favorite FYH product has to be Vegenaise. Potato/macaroni salads, sandwiches, dressings -- it is so useful!